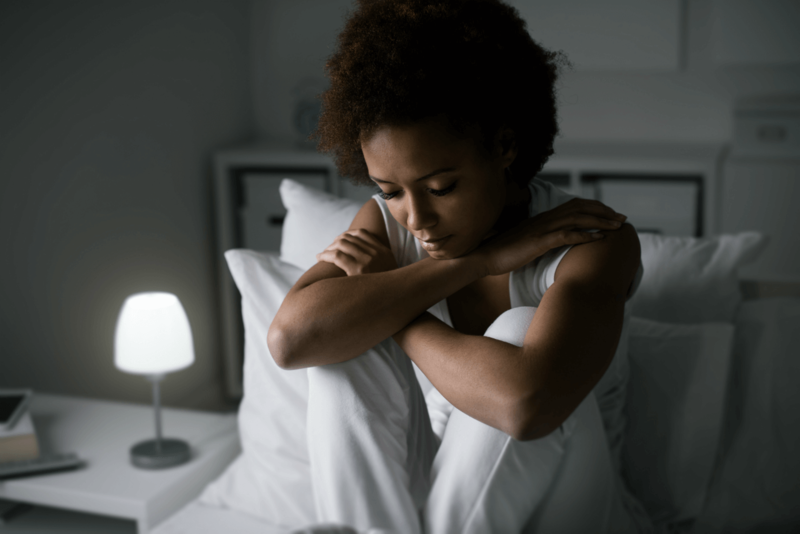 If anxiety is keeping you up at night, try out these tips to help put your worries to bed. For how many tens of thousands of years have human beings been without the amount of electrical, auditory, and visual stimulation we take in everyday, and every night? Between television, computers, laptops, tablets and phones, ipods, earbuds and streaming media — which are used extensively every day, and every night — and which have come upon us as a species relatively quickly, our brains are in shock. It’s like having cold water splashed on our face. We are too often over stimulated. And, that can disrupt our sleep cycle. So, the first tip is to minimize visual and auditory stimulation, at least one hour before bedtime. If you watch television or surf the net in bed before turning out the lights, and have difficulty sleeping, stop. Some people find it helpful to not only minimize visual stimulation, but wear an eye mask to block out any extraneous light. White noise devices can be helpful in drowning out extraneous sounds. For many tens of thousands of years, and even much longer than that, human beings have been sleeping, and waking, according to the rhythms of daylight and nighttime. In today’s world of excessive electrical stimulation, it can be daylight 24/7. We’ve all pulled all-nighters and know the next day is a bit off kilter, off center, we’re not quite right, less focused, more scattered, and tired. Our “circadian rhythm” was disrupted. The circadian rhythm is our sleep-wake cycle. We want to take advantage of the long, long history of sleeping patterns for our species. One of the most basic way is setting a schedule. In prehistory, it wasn’t much longer after nighttime started that we slept, and, of course, woke up at or prior the break of daylight. Today, with so many options of distraction and diversion, from boredom, from anxiety, we inadvertently work against going to sleep. So, schedule your bedtime, and schedule some activities about an hour prior bedtime, that are conducive to calm and quiet, such as reading, or even just taking time to meditate, reflect upon the day. About an hour before bedtime, dim the lights; if music is on, it should be the kind that is soothing for you. Go to bed well nourished, but having not eaten close to bedtime. The suggestions above are more about creating an external environment of calm and quiet before going to bed. We can also create an internal environment of calm and quiet. Self-calming techniques can be very helpful in reducing anxieties of the day. Self calming can include positive affirmations and pleasing visualizations, progressive relaxation, and mindful attention upon our physical existence. Some people find aromatherapy diffusers with specific essential oils very conducive to calm and quiet; some find synthesized music, or “soundscapes” designed to lower brain wave patterns towards those evident in deep sleep very effective in helping when they’re too anxious to sleep. Even then, the mind may be overactive, amped up, revving, and the best approach towards that situation is laissez faire in which we acknowledge it, and let it be as it is. The body is naturally inclined towards sleep at night. Eight hours of sleep is considered normal, but deviations from that norm are common and not unhealthy. But, if you are having trouble sleeping, at night, when tired, then preparing a calm and quiet inner and outer environment is going to be very helpful to falling asleep. If you’re too anxious to sleep, medication is certainly an option to help. But, like surgery, medication ought to be more of a last chance option. It is worth your time and effort to balance your own circadian rhythm naturally, organically, using the tips above. If in bed and too anxious to sleep, you can’t make it happen. It’s not a matter of will, or strength, or desire or intention. All you can do is let it be, and adopt a restful, calm, quiet approach of observing, witnessing, being mindful of, the wild wanderings and meanderings of the mind, most of which is memory and conjecture. In fact, you may not sleep; but, you can rest; you can be comfortable watching the audio-visual motion picture on the screen of your mind. You can visualize, and daydream, as you lay there, in a dark, cool bedroom. You can become attentive to your breathing, your life force, rising, falling, day in, day out, when awake, when asleep. Being awake is what we call being alive; of course, we’re alive when asleep, and when dreaming, but we’re not conscious of it. If you’re too anxious to sleep, you may be living your life out of step with your bio-rhythms. In today’s world of convenience, we miss out on a lot of physical exertion so common to our ancient ancestors, and the brain they had, which we inherited, and which is kind of in shock from rapid overstimulation. Exercise can be helpful in normalizing our bio-rhythms, and reducing general anxiety; go for walks, or a jog, a swim, a bike ride, go to the gym, or yoga class, or a hike in the woods. At work, set priorities, follow through with tasks, take stretch breaks and do some deep breathing. Be satisfied with what you accomplished this day, and know there is more awaiting tomorrow, and which will be handled well enough, as evidenced by the fact that you’ve handled many already and are still standing, in large part, because you have slept. Above all, know that you instinctively know how to sleep. You’ve been doing it a long time after all. This post originally appeared on Talkspace.com.